The BodyHealt Walker Combines Style, Comfort and Durability in One Convenient Package! A safe, convenient aid to perform all your daily activities, the BodyHealt Adjustable Height Walker combines strength with lightweight ease of use. It’s made using solid aluminum construction to provide long-term durability and use, accommodating a weight capacity up to 300 pounds. An optional roll-out seat and foldable design make it a great option for anyone who needs assistance getting around. DURABLE CONSTRUCTION. Lightweight yet sturdy, the BodyHealt Foldable Walker is made using durable aluminum to provide long-lasting strength and use. It accommodates a weight capacity up to 300 pounds and is furnished with slip-resistant, rubber armrests to furnish enhanced comfort and a secure grip. OPTIMAL COMFORT. For added convenience, the BodyHealt is furnished with an optional seat. You can roll up the canvas material and fasten it into place when walking, then conveniently unroll it at your leisure to sit comfortably and securely whenever you need a break. FOLDABLE DESIGN. Using the trigger release feature, you can fold the walker and make it flat for easy storage and portability. This convenient feature is ideal for individuals with limited finger dexterity, allowing the user to close the walker without removing their hands from the handles. HEIGHT ADJUSTABLE. The BodyHealt walking aid features eight height adjustments to accommodate a wide variety of users. Simply snap the legs and lock into place to set the height that's most comfortable for you. SECURITY FEATURES. 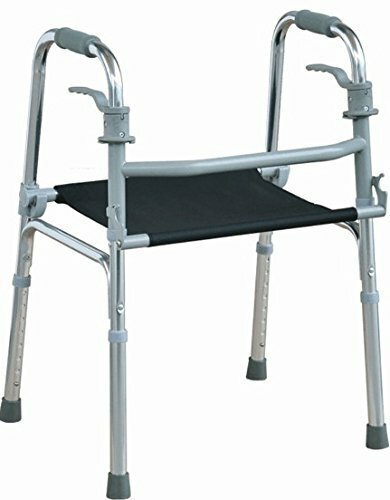 In addition to the durable construction, the walker is furnished with a backrest bar to ensure your security when sitting down to take a break. Moreover, slip-resistant feet provide the stability you need when walking indoors and out. If you have any questions about this product by BodyHealt, contact us by completing and submitting the form below. If you are looking for a specif part number, please include it with your message. Walking Aid - Junior Walker Dual button folding walker. Red button with extra bar. Weight Capacity 250 lbs.